The Grateful Dead, 'Truckin' Into The Sunset The Grateful Dead play their final shows at Chicago's Soldier Field this July 4 weekend. NPR's Eric Westervelt reflects on how the Dead disrupted the musical and business norms of the industry. 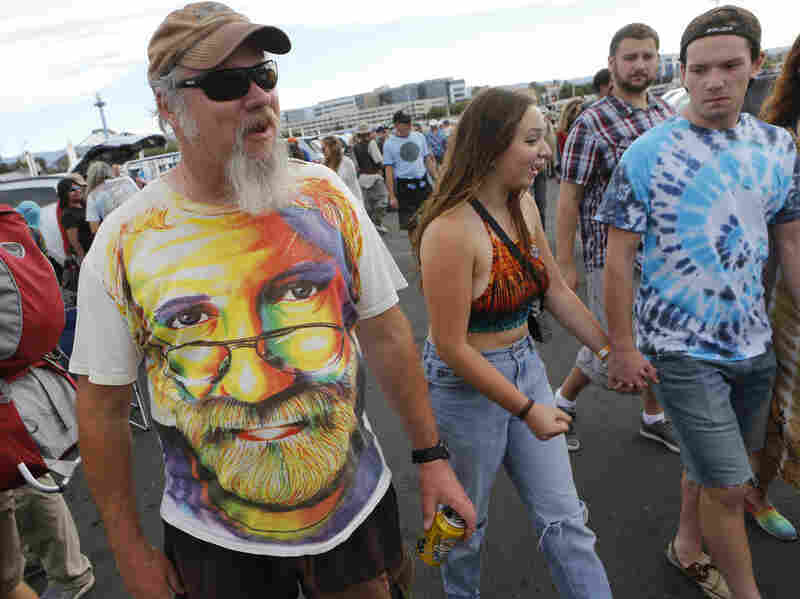 Marc Pierce, 51, of Baker City, Ore., wears a Jerry Garcia T-shirt as he heads to the Grateful Dead concert at Levi's Stadium in Santa Clara, Calif. This weekend fans say goodbye to a rock band that embodies two quintessentially American traits: innovation and excess. The Grateful Dead say fare three well with their final, sold out concerts at Soldier Field in Chicago. The Dead, in their own hazy meandering way, disrupted both the musical and business norms of the industry. Musically, the Dead didn't just break the mold, they melted it with high heat and stirred it with touches of American jazz, blues, country, bluegrass and Cajun. With their late guitarist Jerry Garcia's one-of-a-kind riffing, boldly melding mixolydian and blues scales, the band crafted its own genre. They played without a map. That meant on bad nights they ran into musical brick walls or headed down self-indulgent highways. Missed notes. Botched lyrics. Psychedelic ramblings. But when it worked, the band took improvisational exploration to Coltrane-esque heights with joy and fervor. As founding member Bob Weir said of the live shows, "It's pretty evident that what we're doing is going fishin'. And sometimes we come up with catfish and sometimes we come up with trout." It's apt, perhaps, that the band got together in the back of a music store in what was then the sleepy city of Palo Alto, California, south of San Francisco. Today Palo Alto is the well-heeled heart of Silicon Valley, where the digital revolution "disrupts" forms of traditional business. Business wise, the Dead did things that didn't yet have a name but are now embedded in the digital economy: The band famously let fans record all of their live shows. These recordings were then bartered like gold. Dude, I'll trade you a soundboard of Cornell '77 for Boston Garden '93? And a thriving economy of Deadheads selling and trading T-shirts, food and, yes, drugs followed the band everywhere. The band was one of the first to hire an archivist and create a database of its vault full of shows. Now such things are called the sharing economy ... viral marketing ... crowd sourcing. But excess is also baked into part of the group and its scene. Four of their pianists died, two from drug or alcohol problems. Lead guitarist Garcia was a heroin addict, which contributed to his death in 1995. There were surely fan casualties — psychedelic wipe outs from the band's endless tours. And these days it takes more than a VW bus to follow them. For the final shows, tickets are pricey, and sky box seats even pricier. I saw a Deadhead sticker on a Tesla Model S. A little voice inside said, "don't look back, you can never look back." But the Dead always did it their way. They took risks and broke new ground. and they're going out on their own terms. What's more American than that?